View of the stage from the rear of the auditorium. 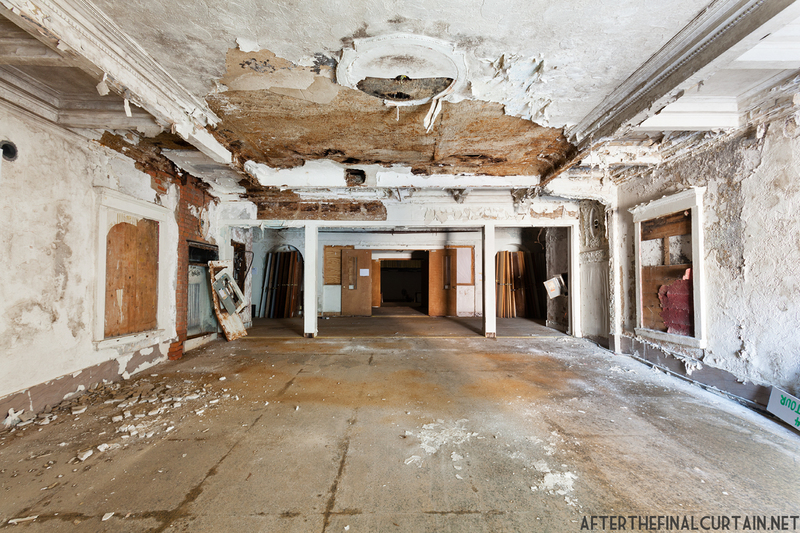 The Moreland Theatre opened on January 12, 1928 in Cleveland, Ohio. It was designed by the local architectural firm of Braverman & Havermaet for A. T. (Adolph) Wallach, a real estate entrepreneur. The 1,296 seat theater is located in the Buckeye neighborhood, which had the largest concentration of Hungarian immigrants in the country at the time the theater was constructed. A press release for the opening of the theater describes it as having, “the most modern system of indirect side lighting,…newest type of projection machines,…and every facility and resource to contribute to the complete enjoyment of its patrons.” The Moreland cost $300,000 to build, equal to a $4,156,421 budget today when adjusted for inflation. 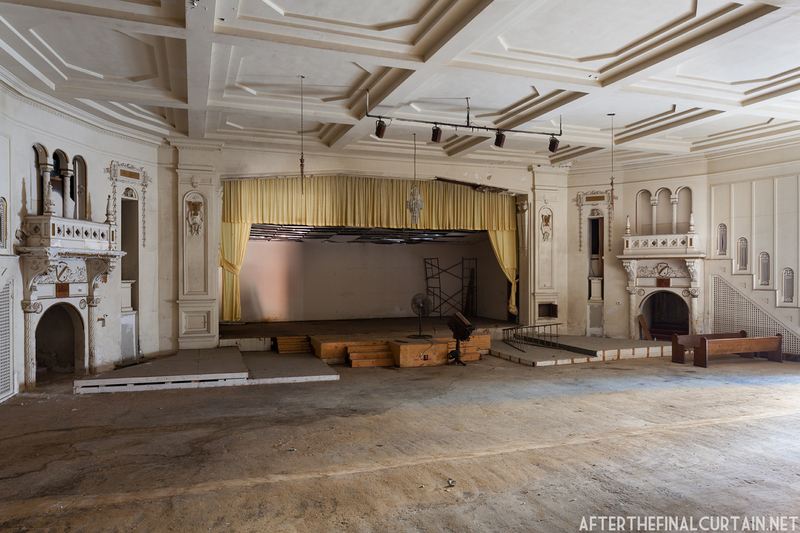 The auditorium floor was leveled in 1963 when it was converted into a dinner theater. Originally built for vaudeville and silent films, the Moreland was part of the Universal-Variety circuit and opened with, The Cat and the Canary, starring Laura LaPlante. The film was accompanied by a live performance by George Williams and his band, the music box Merrymakers. Larry Jean Fisher, “The Texas Organist,” played the $40,000 Kimball organ throughout the opening night. The owners made sure to program for the theater’s Hungarian community soon after opening by scheduling the Hungarian Elite Mixed Choir, who performed in March 1928. 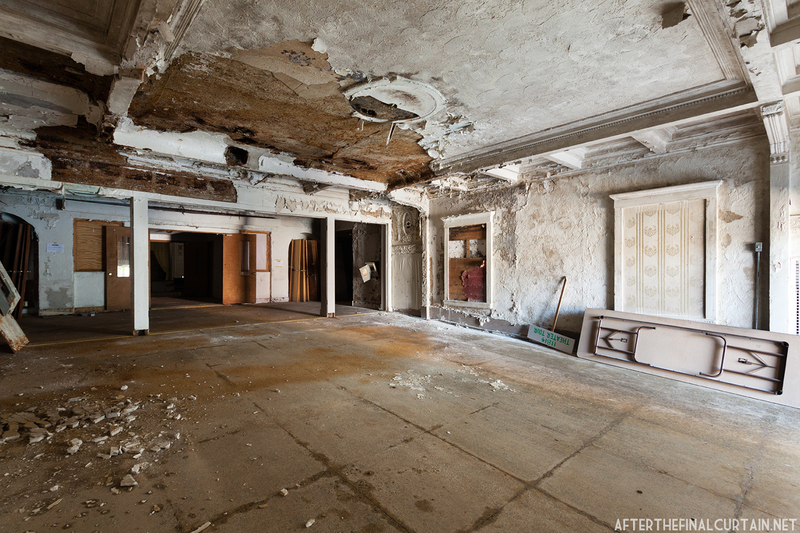 The lobby was gutted by a fire in March 1968. 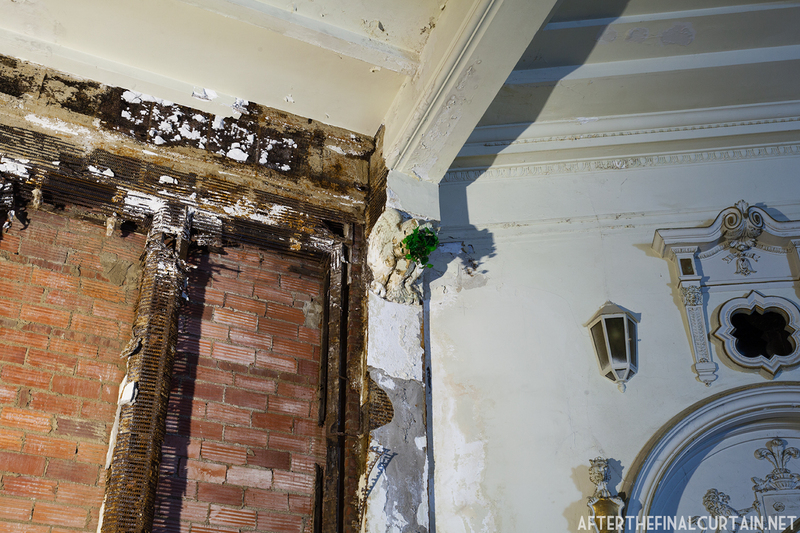 However, some of the ornate plasterwork was salvaged. In October 1929, theater operator Paul Gusdanovic took over the Moreland Theatre. He already had a partnership interest in the Regent Theatre, which was located a few blocks away from the Moreland. Gusdanovic began jointly operating them, but was forced to close the Moreland in December due to the Stock Market crash of 1929. He reopened it a few times showing primarily Hungarian films as well as hosting community events. Plasterwork details above a fire exit in the auditorium. The G&P Amusement Company of Cleveland acquired the lease to the Moreland in 1937. 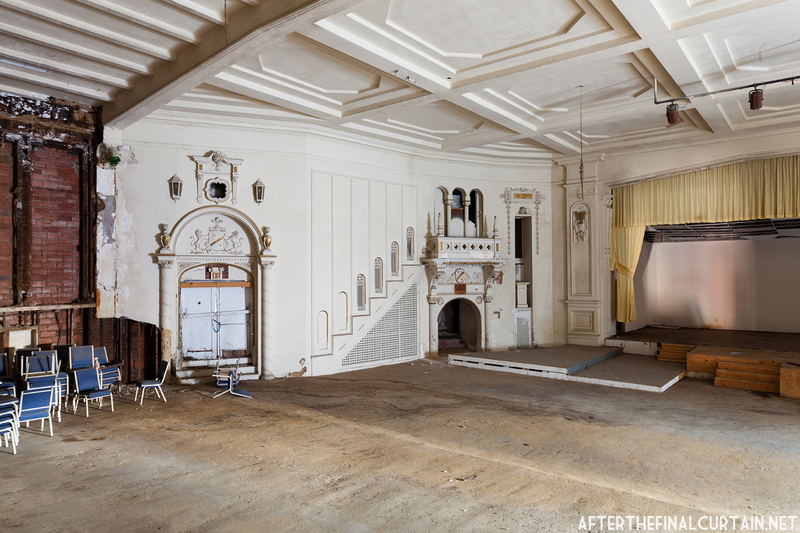 They remodeled the theater, adding a new RCA sound system, and began showing daily double features of Hollywood films. 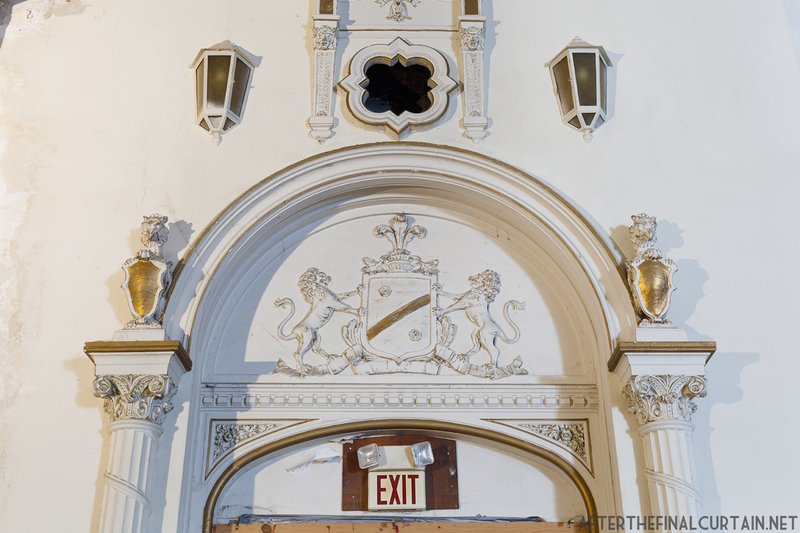 However, G&P ran into problems early on as they faced competition from the Gusdanovic’s Regent Theatre and the newly opened Colony Theatre in Shaker Square. In March 1949, G&P filed suit against the owners of the Regent, along with four other studios — 20th Century Fox, Loew’s, Warner Bros and Universal Studios — claiming that the Gusdanovic conspired with the studios to ruin the Moreland. G&P were eventually forced to close the theater in 1950. The Cleveland District Court ruled against G&P in 1952 — the judge said that the neighborhood could not support two theaters. G&P appealed the decision to the Sixth Court of Appeals who upheld the lower court’s decision. 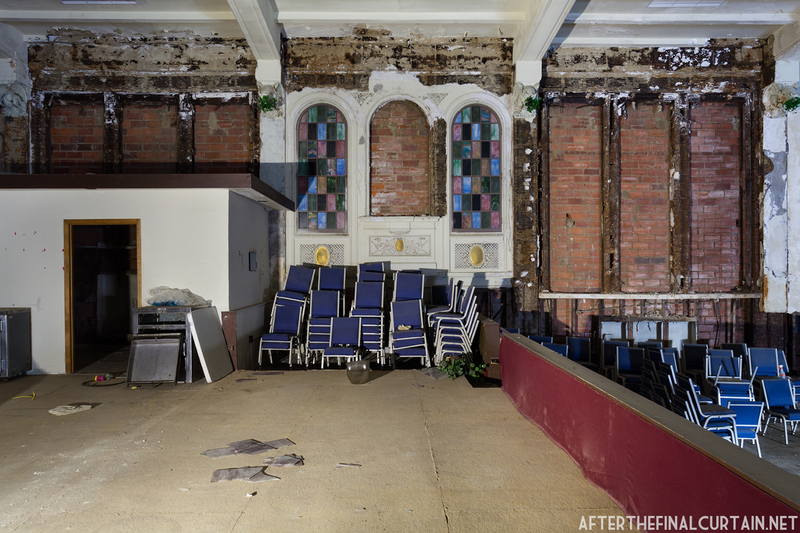 During the conversion to a dinner theater a terrace was added to rear of the auditorium for use a dining area. The Moreland opened, closed and reopened throughout the 1950s and early 1960s. 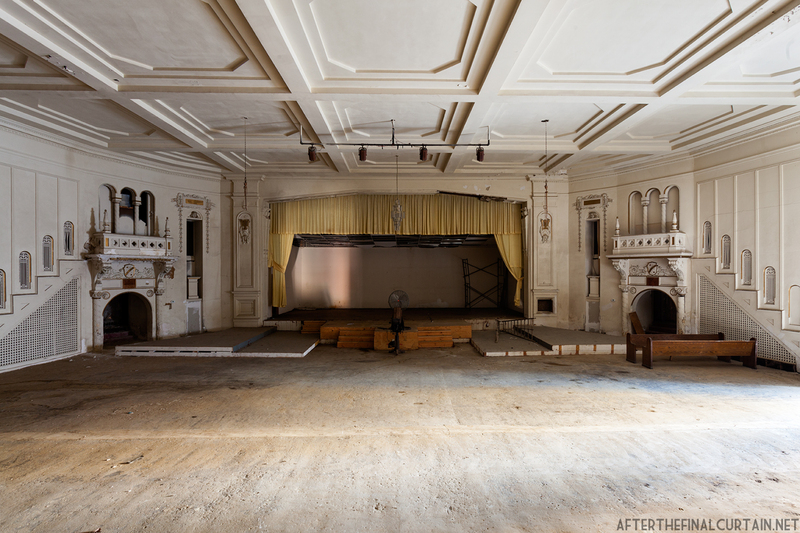 It was remodeled into a musical dinner theater in 1963 by Gerard Gentile, William Boehm and Eugene Woods. 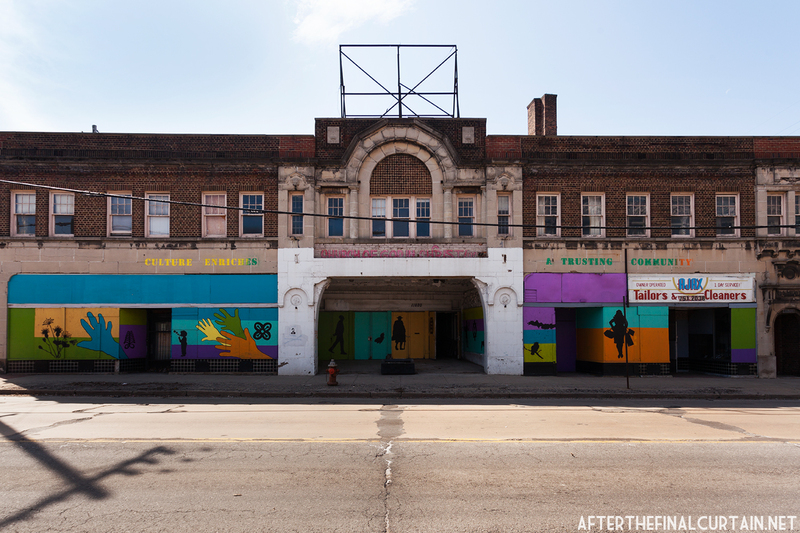 The trio had experience in theaters in the Cleveland area and were determined to revitalize the Moreland. It opened as Players Theatre Café in January 1964. Once again, the reopening was short lived and the theater closed in April 1964. It reopened again as the Beach Party Room in July 1967, with three inches of sand and artificial palm trees in the auditorium to help give the illusion that patrons were attending a party on the beach. This venture only lasted four months, after which it was turned into a dance club called “Second Shadow Lounge” in October 1967. 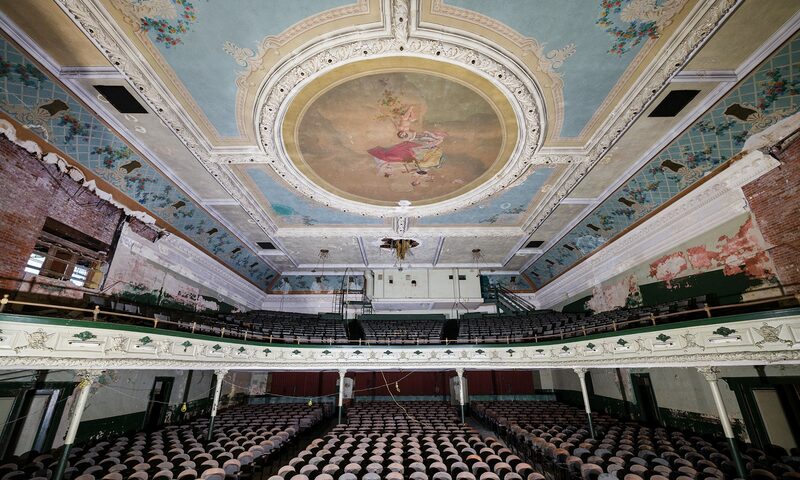 This too did not last very long, and the theater became a Hungarian playhouse in June 1969. 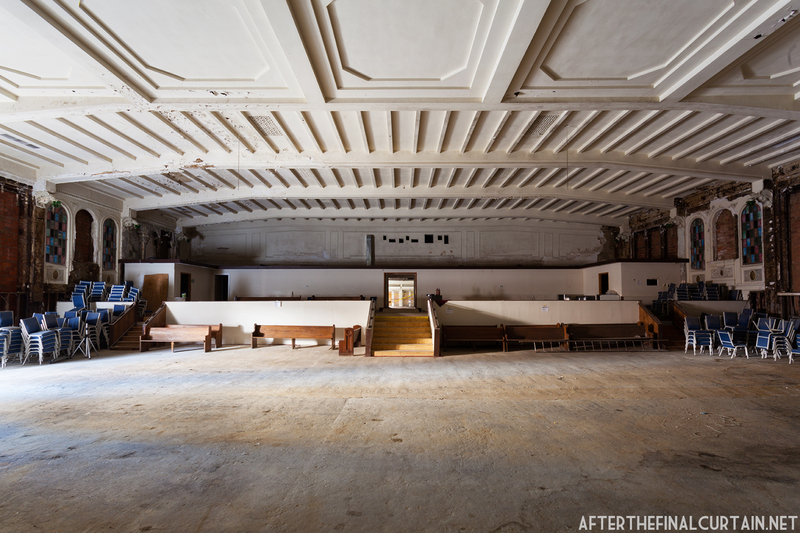 By 1975 the theater was closed again, and three years later it was sold to the Church of God in Christ (CGC). 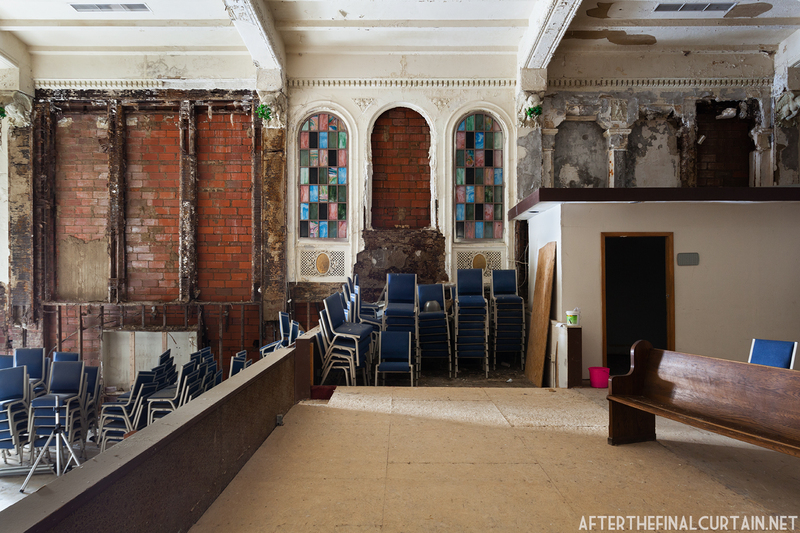 CGC became the theater’s longest tenant, using the building as a worship space for almost thirty years. The exterior of the Moreland Theatre. The CGC sold the theater in 2007 to the Buckeye Area Development Corporation (BADC), a not-for-profit community development corporation serving the area. 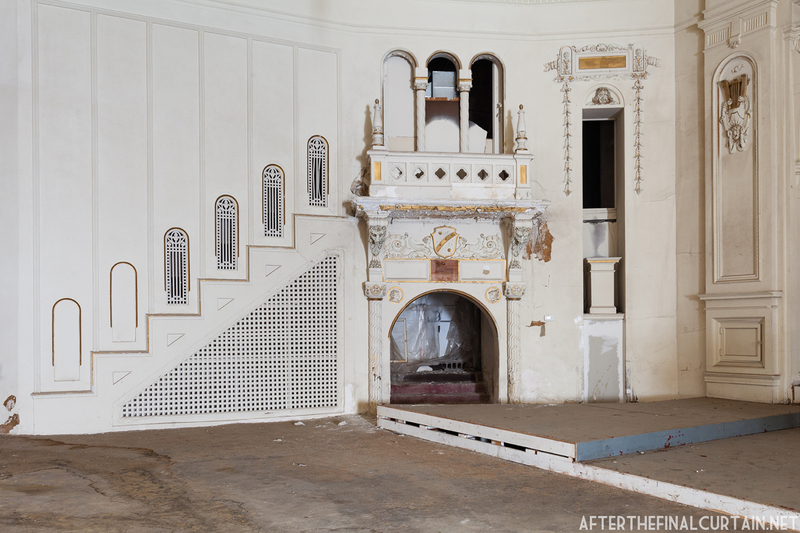 BADC planned to restore the theater as a cultural center, but have yet to raise the estimated $6.1 million needed to renovate the building. The Church of God in Christ covered the plaster gargoyles on the auditorium walls with fake plants.